With over 1.7 billion active users, Facebook is one of the most visited websites in the world. That's a lot of traffic. No doubt you've realized the enormous potential of this media; you carefully build your Facebook Ads, you curate your page content, you build your community. 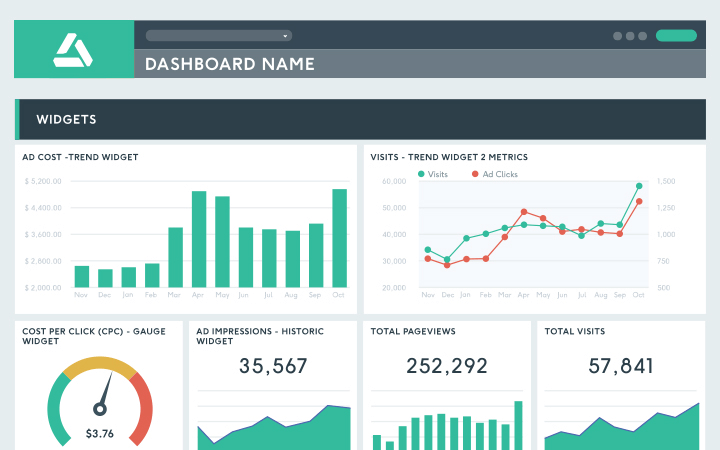 Now you can assemble all your results in one place with a Facebook analytics dashboard! Facebook is a big part of your social media strategy, but it isn't the ONLY part, right? You measure your social media strategy success with a multitude of tools, and it's a pain to retrieve your data from every one of those platforms all the time. Instead, link all of your reporting tools to DashThis, and we'll do the data-fetching for you! We'll even send out your dashboard's reports automatically: just create your mailing lists and you're done! You know all the KPIs you need to track: reactions, likes, comments, shares, paid and organic reach, page likes, and probably way more. By using our preset widgets, or creating your own custom widgets, you can see all your pertinent data in your Facebook analytics dashboards! Our goal is to keep Facebook dashboard process as simple as possible for you, while still offering you all the features you need. All the benefits of a customizable tool, without the hassle of needing an IT specialist to help you with the process! Pretty sweet, right? Want a fully custom Facebook report that looks like your brand? Our designers would be happy to create one for you! Our blog is full of social media related content!